Now, the stationary well marked low has at last started moving westwards, crossed into land and is over Telangana region. As result, Orissa and North A.P. recieved rainfall ranging from 30-90 mms. The "pushing pulse " from the low has formed an upper air circulation off the west coast, somewhere around the Konkan-Goa coast on Saturday night. 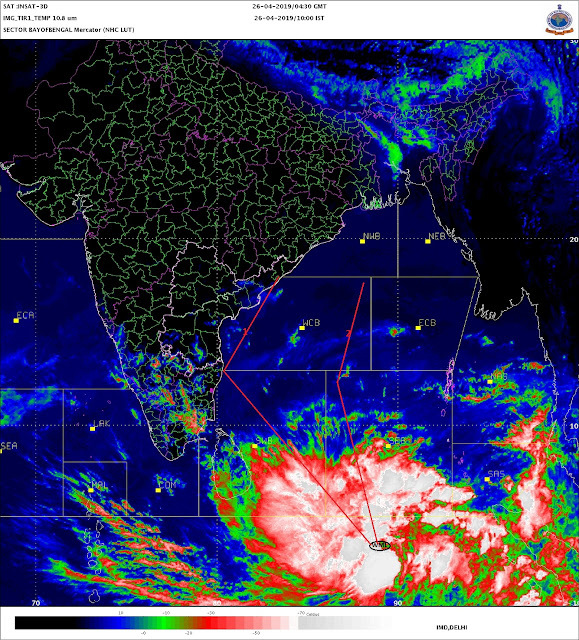 Hence, again, some extermely heavy rains could occur in South Konkan, Goa and northern regions of interior Maharashtra. As per COLA predictions, very heavy rains can be expected in Nasik and districts of N.Maharashtra. These heavy rain predictions can be expected on Saturday/Sunday. Another low could still be expected in the bay early next week. The Climate Prediction Centre ( US National Weather Services) predicts an intensification of the upcoming low to a depression level or more. This year looks like an extensive typhoon churning weather from the South China Sea/West Pacific Ocean. The region is already alive with two Category-4 typhoons closely after typhoon Ketsana making a landfall over Vietnam two days ago. One of them, Parma, is heading for the South China Sea, and intensifying. The other prevailing Category-4 storm is Melor, and heading for Cat.5. A trough extending from India right into the west Pacific (Map ) is the reason for development of weather systems in the west Pacific/South China Sea. And, reason for pulses to continue in the Bay of Bengal, at least till end of October. ( This could mean a good begining to the N.E. monsoon for the south). Mumbai: Sunday will be cloudy, with a high of 31c, and low at 27c, with showers in some parts of the city, and evening will be windy and thundery. Rains of medium intensity will continue on Monday. Sunday/Monday rainfall could be around 25-30 mms. With the process of withdrawal of the monsoon getting stuck, for almost 15 days now at 20N, a heat wave in the northwestern areas of the subcontinent is created. On Friday,2nd, Chorr (Pak) reached 44c, highest in Asia for the day, Karachi was an unbearable 42c, and in India, Bikaner and Jaisalmer were 41c, while Bhuj in Kutch touched 40c. This regional heat wave can continue till Sunday. The temperature chart of India shows a clear division of heat in the west, and normal/below normal temperatures in the "monsoon areas" of the eastern/southern half.